Now that George Bush is out shilling for his “memoir,” it’s a good time to look again at Stephen Colbert’s keynote speech with Bush in attendance at the 2006 White House Correspondents’ Association Dinner. Colbert was said by the rightward portion of the punditocracy to have “bombed” — and the increasingly stunned silence of the audience seems to confirm that. But it’s pretty clear in retrospect that he got it right. (For example, this is where he introduced the phrase “Reality has a well-known liberal bias” into common parlance.) The speech is scathingly funny and is a gutsy instance of speaking truth to power in the presence of a press corps that is supposed to do so, but doesn’t. In any event, Colbert’s appearance so shook things up that the next year the keynote speaker was Rich Little. Rich Little. The comedic equivalent of white bread and tap water. This entry was posted in TGIF on November 19, 2010 by Michael Happy. 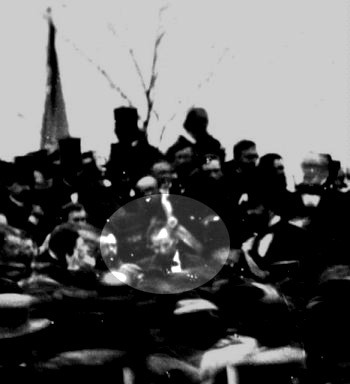 The only known photo of Lincoln after giving the Gettysburg address. The speech was so brief that it caught the photographer unawares. This entry was posted in Anniversaries, Educated Imagination on November 19, 2010 by Michael Happy.